The delegation of the Association "Uztextileprom" and representatives of the textile and garment-knitwear enterprises visit the Republic of Poland on November 19-25, 2018, press service of the Association "Uztextile" reports. At the Embassy of Uzbekistan in the Republic of Poland, a meeting was organized between representatives of textile and garment and knitwear enterprises of the Uztekstilprom Association with the leadership of Polish textile companies on November 20. 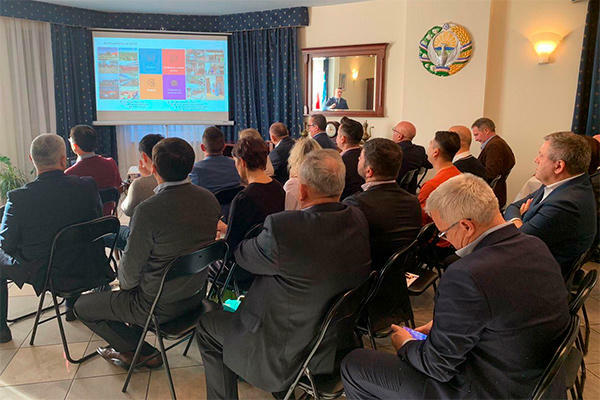 The meeting with the participation of more than 40 managers and representatives of leading Polish textile companies was initiated by the Uzbek Embassy in Poland. During the conversation, the sides exchanged information on the current state of cooperation plans for the future between Uzbekistan and Poland in the textile industry, investment activities of Polish companies, as well as cooperation in research and development. Then the meeting was held in the QA form and the participants were able to get answers to all their questions. The Uzbek side provided information on the development of the textile industry of the Republic of Uzbekistan for the years of Independence, the adopted programs for the development of industry and the prospects for the short and long term, as well as implemented and implemented investment and social projects in the textile industry. In addition, the Uztextileprom Association made a number of proposals to optimize the export of domestic textile products to the Republic of Poland. Following the talks, the parties reached an agreement on taking measures to implement the most favorable conditions for the export of textile products to the Polish market. Agreements are planned to be signed on November 24 following the results of the International Textile Exhibition “Fast Textile 2018”, which is the most important event of the Polish textile industry. This year, “Fast Textile 2018” will be held from 22 to 24 November in Poland, the city of Nadazhin, near Warsaw, in the new exhibition complex Ptak Warsaw Expo. The 25th anniversary of the establishment of diplomatic relations between Uzbekistan and Poland was celebrated in 2017. The trade turnover between Poland and Uzbekistan is characterized by some stability. The structure of Polish exports is dominated by supplies of live animals and animal products (about a third of total exports), chemical products (24 percent), various machinery, equipment, and motor vehicles (more than 20 percent). Poland imports from Uzbekistan mainly cotton and its products (more than 45 percent), mineral products (25 percent), chemical products (20 percent). Currently, 25 enterprises with Polish capital are operating in Uzbekistan. In 2017, two joint ventures were created in country and one representative office of a Polish company was opened in the fields of energy, textiles, pharmaceuticals and solid waste.